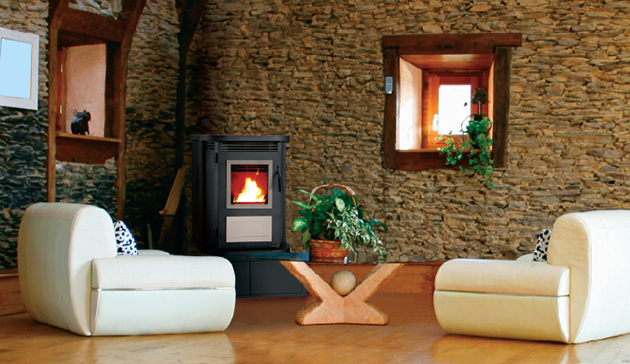 Dependable comfort, customizable options and economic burning make this stove a requirement for cozy heating. Transforms into four unique styles with customizable window frames, door panels and vent grills. 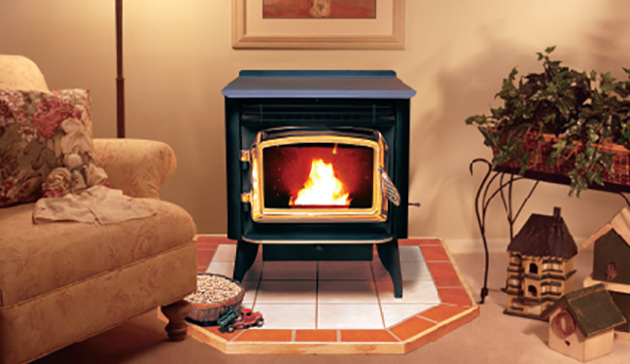 Reflective ceramic glass effectively radiates heat and blocks firebox view when not in use. Wall mount thermostat precisely controls room temperature and provides fully automatic operation. Effectively burns standard- and premium-grade fuel in fully automatic mode, offering a dependable, low-maintenance heat source. Large 50 lb. hopper and automatic feed system eliminates constant tending to the fire and burnout. Patented UltraGrate™ achieves nearly 100% combustion efficiency. FastFire™ self-ignitor for one-button starting. Ash drawer is easily accessible and can be removed quickly for simple cleaning. Four different trim kits are available: Arch, Artisan, Contemporary and Cast-iron Gothic Arch. Can be vented horizontally through an outside wall. A decorative log set can be added to complete the look. *Square-feet heating capacities are approximations only. Actual performance may vary depending upon home design and insulation, ceiling heights, climate, condition and type of fuel used, appliance location, burn rate, accessories chosen, chimney installation and how the appliance is operated. Multiple design options to customize to your taste. Large, heavy-duty welded steel heat exchanger provides efficient heat transfer and maximum durability. 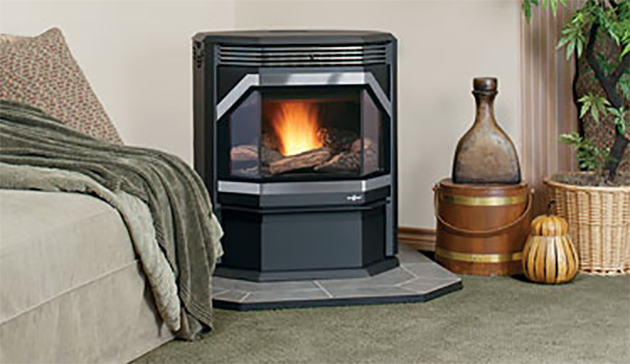 Smart Heat™ technology delivers the ultimate in precision heating and comfort control. Large and easy-to-load hopper holds up to 60 lbs., requiring less loading and ensuring longer burn times. Easy-to-use, concealed controls allows for convenient temperature control. Extra-large ash drawer removes quickly and easily for simple cleaning. Durable, cast-iron burn pot, with airburst feature, self-cleans for less maintenance and trouble-free starts. Easy, unobstructed access to internal components makes cleaning and service simple. Sealed blower and auger assembly ensures quiet operation and never need to be greased. Innovative self-ignition system delivers hassle-free automatic starts and works with a thermostat for easy operation. Quick access to components makes cleaning quick and easy. Unique air wash system creates less maintenance and a clear view of the fire. Optional door and grill finishes add to the attractive look and feel of a comfortable setting. An optional log set and/or brick panel provide realism and design opportunities. Expansive 60-lb. hopper and innovative automatic feed system eliminate constant tending to the fire and burnout. Optional decorative gold door adds to the attractive and striking appearance.